The Wilton’s archive is an incredible resource for uncovering our past, however the formal sequence only begins with the formation of a group to save Wilton’s from destruction in 1965. Materials pre-dating this have been generously donated in more recent decades. Arguably the most valuable resource is the living memory of those who played an important role in the history of Wilton’s. David Mason was the son of the caretakers who looked after Wilton’s during the latter years of the Old Mahogany Bar Methodist Mission. Though just a child at the time, Mr Mason has wonderful recall of the spaces in which he spent his formative years. 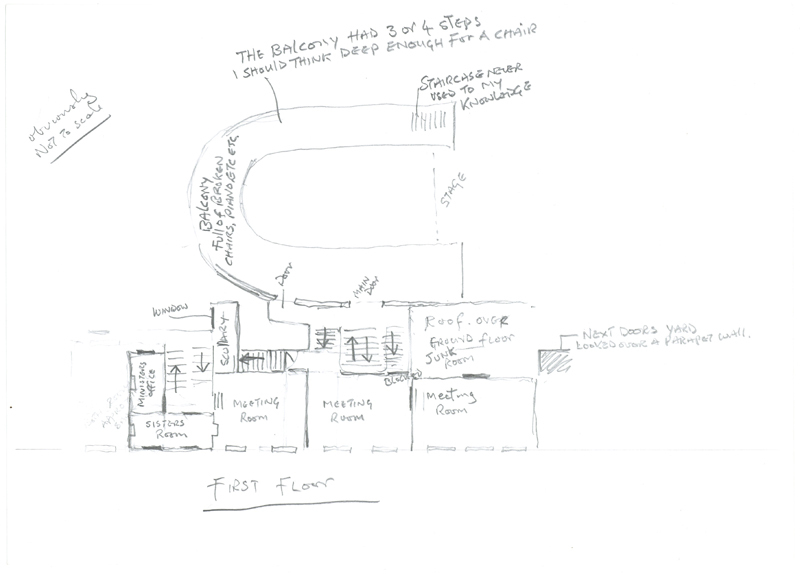 In 2011 as Wilton’s prepared for the first phase of restoration Mr Mason kindly sketched the building layout as he remembered it, giving us an invaluable record of an otherwise thinly documented period. The restoration was careful to ensure this history of the building is readable in the spaces and not to restore them to any period of time in particular. We have, unfortunately lost the billiards tables. In his plan of the ground floor Mr Mason shows that the Hall was marked out as a badminton court. During the restoration work a ping pong table was installed in the Hall and started a short period of tournaments! Parallels can be seen between the use of spaces. The new office kitchen is in the same position as the Mason family’s; the archive room is labelled as ‘workshop’ which seems appropriate, however the office as ‘play room’ is less so. 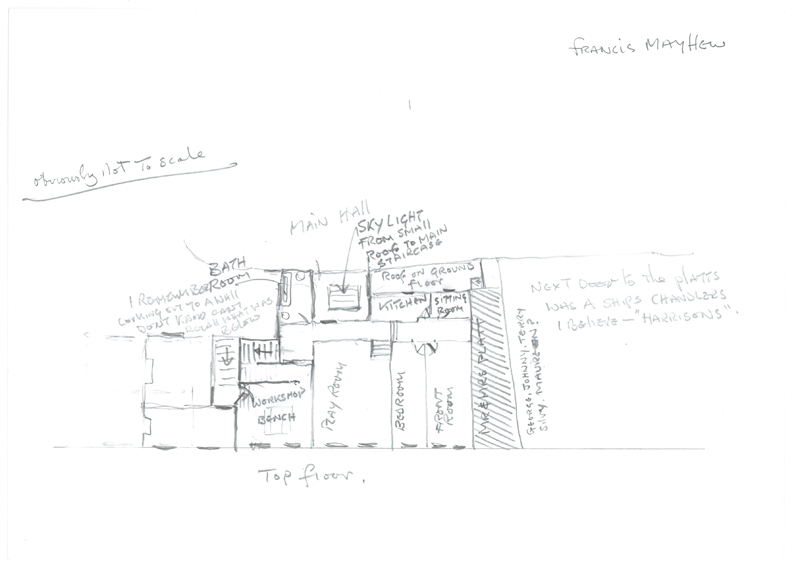 These sketches match the historic plans held by the London Metropolitan Archive and the many restoration proposals in our archive to track the architectural history of the building, however the personal annotations of Mr Mason give us a more valuable social history record. Our historian interviewed Mr Mason and more of his memories are in our publication Wilton’s: A History of the Hall and Houses, which is free to pick up onsite. 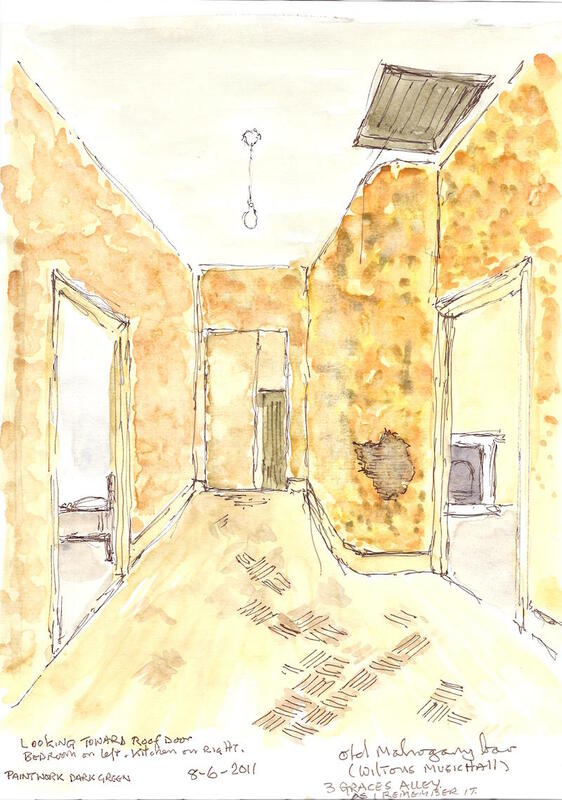 As with many of those who have shared their memories and donated materials back to the Wilton’s archive, Mr Mason shared more personal items with us, allowing us to scan family photos and some wonderful watercolour images of the interior to retain in our ever expanding digital archive. A photograph taken on one of Wilton's roof gardens. This space now has a roof and is next to the offices. The archive itself is a memory bank but there is nothing to compare with the living memory of individuals who infuse the papers with an added personal significance. You can read more about David Mason's memories of Wilton's at spitalfieldslife.com.